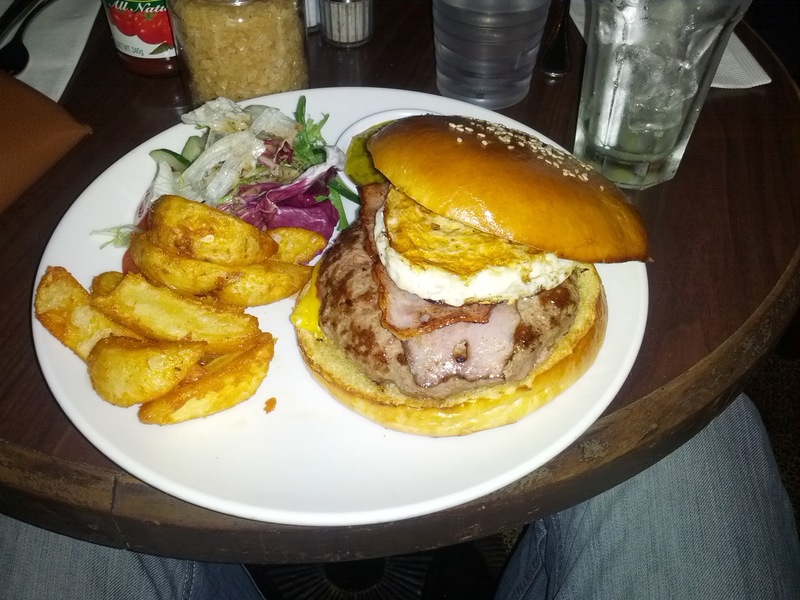 Jamie’s Italian burger is a decent hamburger. On paper the burger sounds better than it looks, and on the table it looks better than it tastes. It’s a simple burger that is trying to be too wholesome, but it can’t. A hamburger that will generally appease those momentary burger cravings, but will trouble one with interim bites full of irregularities. Was the plan to make a healthy burger? A burger that one might enjoy without guilt from time and time? Could be… but for all the healthy tidbits a lot of this burger looks and feels a bit too processed. The burger taste balance in Jamie’s burger isn’t a constant one; the first bite works out to be quite good, but further down the line the taste becomes erratic as bites either lack or plenty something. Start with the patty and something seems amiss, the beef dabbles in an aimless taste that’s not all too bad, but not all that great – it is heavy with salt and textured in a semi-rebounding quality that won’t just tear or crumble with one’s bite. Even the shape of the patty is odd, as if it has been prepackaged and stored – massaged and prepped long before it was cooked… and it tastes of it. Then there’s the congregation of zest that lives in some of the burger bites, that conclude in thirsty mouthfuls; and it won’t take long to realize that the culprit of these bouts of tang lie within the pancetta… tasty but treasonous with its salt. Between the meats, the beef and the pancetta, there is an ingredient that makes a stand for itself, albeit a small one. The cheddar cheese, with its acidic vibrancy and gooey composure, makes a huge mark in seldom bites that contain meagre amounts of cheesy goodness. The rest of the parts – the cut lettuce, the tomatoes, are fresh and dandy, and the balsamic onions give the hamburger a sweet hue. The bread pulls it off, well toasted and with a nice spring to it, it’s working the burger taste balance – though at times it’ll dominate the burger construction. For 178.00 HKD this wholesome burger has a whole lot of price for a whole little burger (taste and size)… The fries are good, but the ketchup is healthily-weird. In the end the burger doesn’t really satisfy the moment and it’ll probably leave you wanting for something else – probably one of Jamie’s famous pastas might be a better bet. Wagyu Deli A. Five’s Signature Burger is an edible hamburger. It is another “hamburger” that suffers from a burger identity crisis, a hamburger for which creativity and burger construction has bereaved it from its burger lifeblood, one that feels as confusing as the name of the restaurant it came into existence from; a burger that remits, what was left ambivalent at first sight, disappointment. Wagyu A5 is considered to be the most magnificent Japanese beef out there – raised with the most scrupulous of care, this meat should boast great fat balance, the smoothest of textures, and a juicy flavor that unfurls onto one’s sense of taste. This is not what resides inside this burger, it is not the meat of an animal that has had a better life than most humans; this is beef too vulcanized to exist between two buns, with an unrelenting texture that causes an unwanted extrication from the burger and a cusp into one’s teeth. The release is a sweetened hue and a robust greasiness that envelops to foil a beef taste that is not there. Unfocusing the attention from the meat, surveying the rest of the ingredients, there’s a slight appeasement of that that could have been. When one notices the burger without the meat chunks this tormentful anguish intensifies, leaving one with a sorrowful sense for the remaining parts. The bun has a tender softness in touch and taste that keeps its roundness; the fine chopped lettuce feels crisp and vegetative; and the onion, slightly fried, is soft and sweet. The touch of Dijon might be a slight too much, but it doesn’t lessen the burger. The fries, seasoned nicely, are good. Not worth 118.00 HKD, this is a hamburger whose disheartening burger taste balance glaringly falls from the grasps of burger decency, a burger experience is delivered that feels somewhat substandard, that one can only feel deprecatory towards even with all its endeavors to become one. Ruby Tuesday’s Bacon Cheeseburger is an exquisite hamburger. The burger institutes a flavorous burger taste balance that is reinforced by a dedicated burger construction – an assiduous duet that delivers an explosive burger experience, a well crafted american burger from a worthy american establishment; a place that is for some reason met with a peculiar skepticism and a what should not be a surprising delectable satisfaction. The burger’s illustrious presentation and simple approachability has all the right colors and connotations. As the burger swings from plate to mouth, as it drips it’s moistness releasing a waftorous part of its soul, journeying from lips to relish on that first instance, it is clear that the savory ingredients devise a wondrous attachment to each other. There is a frangible feeling to the burger that is reassured by the strength found within its form, a form that throughout its life never loses its shape, that demonstrates proper build and well proportioned measurements. The great burger taste balance commences from the patty, a slight hintness of grill and excellent seasoning present a marvelous beef flavor; tenderly built is releases juices that intertwine with a dab of mayo that runs down it’s soft creases and crevices. The buttered bun follows suit complementing the burger’s taste, it has a crisp toasty edge at the point where it meets the inner works and a softness to one’s fingers, this feat of burger engineering allows the bread to absorb while keeping a consistent structure – and while it might feel slightly big it is still breadarrific. There isn’t a sense of overpowerment from any particular ingredient in this burger, although it’s a heavy burger, the ingredients work. The vegetables, though low-key, add a sense of frondescence that manifests in every munch taken. The inviting yellow american cheese is soft and gooey, forming a delicious bond with everything it touches; and the bacon is decorously salty and chewy, making its way through every nibble. The french fries are pretty good. 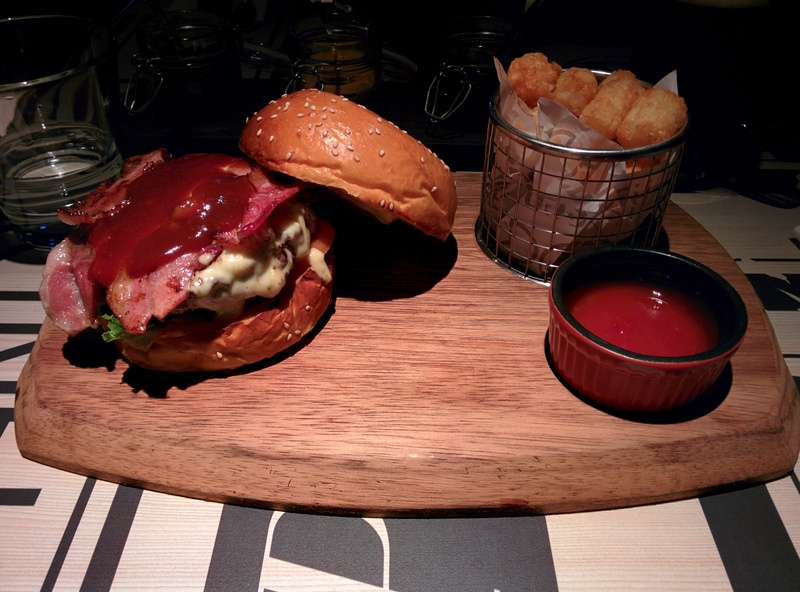 Priced at 166.00 HKD Ruby Tuesday’s burger, though a little pricey, is well worth a try. For some reason the mention of ‘Ruby Tuesday’ is many times confronted by an apprehensive reaction, experiencing this hamburger should change this. 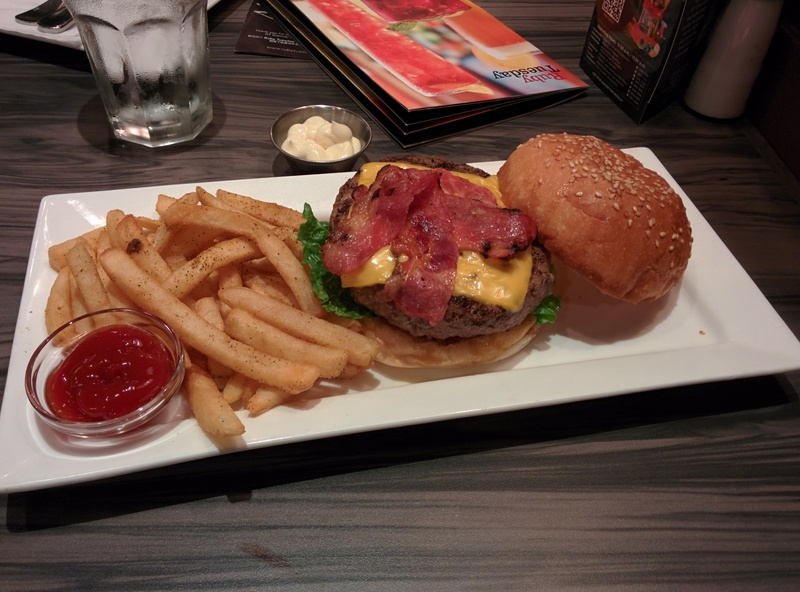 Ruby Tuesday manages to bring a great American hamburger to Hong Kong, it is a burger that offers an exquisite burger experience that should be placed high in Hong Kong’s burger rankings. 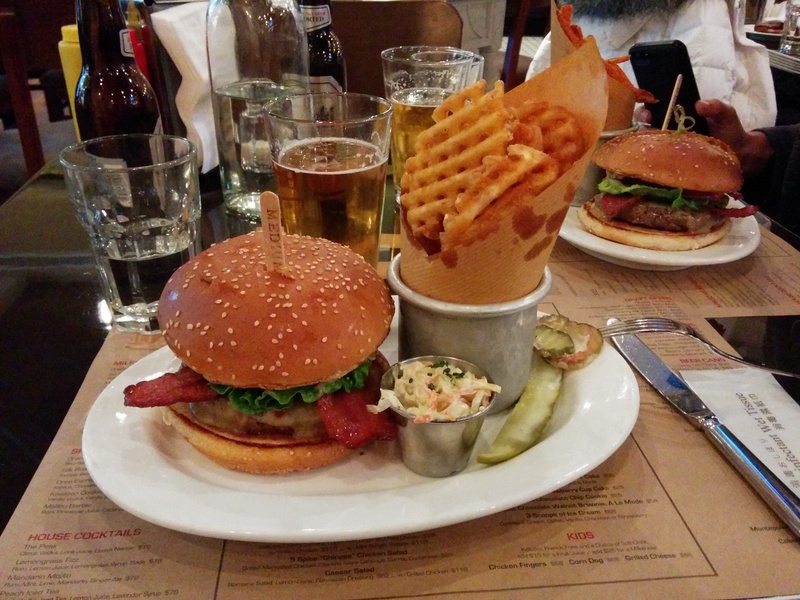 The Chop House’s BBQ beef, bacon & cheddar burger is an exquisite burger. Starting of one a great note, this burger adventure will have a couple of hiccups along the journey towards the end, but upon completion, one can surely be satisfied with what has been experienced – an accomplished burger taste balance, one that shows that this burger has received a certain level of thought and care… at least for its taste. The burger will initially make itself noticed by a delightfully radiating burger smell that touches your senses as it lands at your fore with an accompaniment of a strong BBQ aroma that feels zesty to the nostrils – after all, the burger has been christened with ‘BBQ’ as a first name, and with that one should expect great BBQ flavoring. The result: a rightly rich sweet-sour BBQ tanginess so powerful that the burger should be a little more sparing with its sauce, in actuality the sauce is not bad – the amount just needs to be toned down a little or grilled. Still, remove a bit and I found that the experience was still an pleasurable one… again, in terms of taste. The first bite is quite captivating – the bacon makes a first great impression with a wonderfully sharp salty taste that feels nice to the tongue, not too crispy slightly chewy. Close by, with a shape to perfect to have been hand massaged and fashioned, one can feel the patty charming its way in with an agreeably soft juicy texture and enjoyable beef taste that is seasoned with an appropriate amount of salt. The vegetables, feeling that green crunchiness, play their parts correctly with an outstanding tomato; and the cheese, which doesn’t much feel like cheddar, leaves a gooey touch with a good subtle flavor. The tribulation, a proportional and constructional one, commences about half way through this hamburger when the overloaded heavy BBQ and mayo sauces begin to swirl and swamp the burger – sabotaging the vessel, a soft pleasant but delicate bun that can’t handle the burger’s engineering challenges. Tearing itself apart in the last stages, revealing a patty that feels slightly short, once completed only a terrible mess remains. One does have the option to add additional components to the already overloaded burger; marinated beats, sweet onion, and the stupendous chili mustard. The tator tots are meh. The BLT burger is an exquisite hamburger with a great appearance. 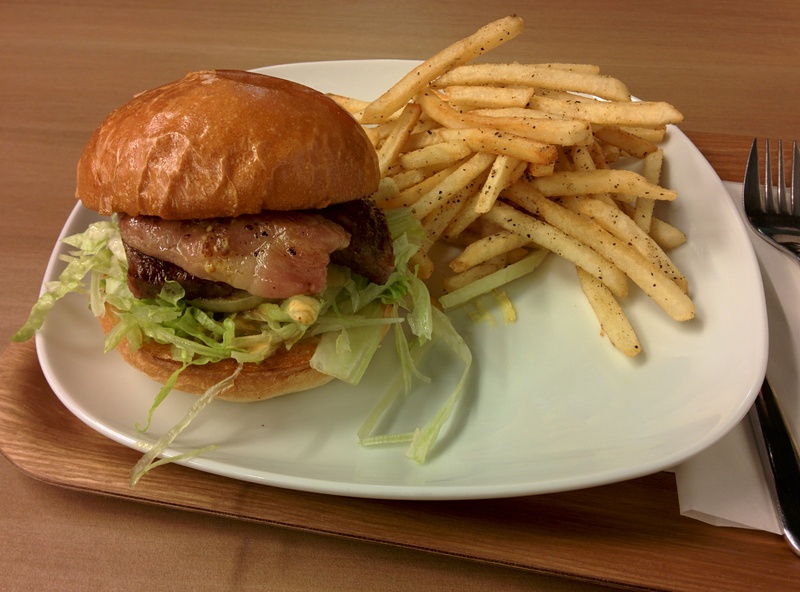 The bun has a nice curvature to it; the bacon, as it firmly sticks out, a great reddish-pink; and the crumpled lettuce, a wholesome greenness. As you observe burgers on other tables, some half cut as it’s occasionally customary in Hong Kong, your hamburger senses will begin to tingle. It shouldn’t be a surprise, but based on previous decent experiences at BLT Burger in Tsim Sha Tsui, this hamburger has a surprisingly great burger taste balance. Still, with an evident pompously oversized bun and a clumsily sized patty the components of this burger, while entertaining, don’t necessarily match up comfortably. Construction flaws aside, overall this is a good burger experience. The properly temperatured patty, which hides within the depths of the mild cheese and the bun, has both a worthy beef taste and a juicy meat presence – strong enough to leave a pink hue on the bun. In turn, the chewy soft bun, which at bites does feel oversized, will hold the juices without tearing apart; that combined with BLT’s secret sauce, which isn’t so secret once you try it, gives this hamburger a luscious feeling – one that your flavor buds can look forward too. The meatiness of this burger is further enhanced by the magnificent bacon, alive with color and a crispy texture, the bacon feels thick with that marvelous bacon taste that burps so good. Along with the veggies, that do a pretty swell job on their own, the burger has a fitting Bacon, Lettuce, and Tomato christening (BLT actually stands for Bistro Laurent Tourondel, but Bacon, Lettuce and Tomato is more fun). However, BLT burger could greatly benefit from a careful look at their own blueprint for a better burger – ask for one when you get there. In it they show how a hamburger should be constructed, but when compared to the real thing, either the bun’s circumference and width need to be reduced or the patty’s diameter and thickness need to be increased. The patty’s is already quite satisfying, thus a more appropriately sized bun could substantially improve the enjoyment of this burger. The thick fries, waffle fries, and sweet potato fries, are all great sides to this burger. For 98.00 HKD plus 10.00 HKD extra for cheese this is a strong exquisite burger, a good calibre hamburger that is worth a try, but that needs a little extra umpf for it to truly be majestic. If you do try it, remember, try the one in Causeway Bay. Marie’s home burger is an exceedingly decent hamburger. There isn’t much to say about this boring burger, and it doesn’t particularly stand out in any way. The ingredients in the burger aren’t exceptionally rich, and together they don’t amount to great heights; its juicy but not all that tasty, the burger taste balance is just… satisfactory. The patty, a little too thin for the hamburger, doesn’t convey an exceptional beef taste; and the bacon, with a rubbery chew to it, doesn’t dispense the saltines or fat needed for that divine breakfast bacon burp. I can only hope that the Angus cow and the pig enjoyed beautiful lives full of passion and excitement; cause in death, they sure tasted dull. Breakfast, I mention breakfast because if anything, and if it’s any indication from the restaurant’s name, the burger feels like it could be a breakfast hamburger; the fried egg, the only one to leave a mark, makes it so – unfortunately, it’s not a burger special enough to be a worthy first meal of the day. The cheddar is so weak, you can’t enjoy a cheesy brunch; and the brioche bun so soft that it’ll give you a sense that it’s crumbling the instant you caress this burger. The vegetable salad is fair, but its purpose, indicated by the dressing and cherry tomatoes, is to be a salad, not a condiment. The potato wedges, a little hard on the inside, were just acceptable. At 118.00 HKD I would expect the burger to have a much better taste; you are better off ordering a different breakfast option, or getting a burger elsewhere. I think Marie has to reconsider how much care she puts into her burger, at least she got the temperature right.